This article is about the culinary herb known as “sage”. For other uses, see Sage (disambiguation). Salvia officinalis (sage, also called garden sage, common sage, or culinary sage) is a perennial, evergreen subshrub, with woody stems, grayish leaves, and blue to purplish flowers. It is a member of the mint family Lamiaceae and native to the Mediterranean region, though it has naturalized in many places throughout the world. It has a long history of medicinal and culinary use, and in modern times as an ornamental garden plant. The common name “sage” is also used for a number of related and unrelated species. Salvia officinalis has numerous common names. Some of the best-known are sage, common sage, garden sage, golden sage, kitchen sage, true sage, culinary sage, Dalmatian sage, and broadleaf sage. Cultivated forms include purple sage and red sage. The specific epithet officinalis refers to plants with a well-established medicinal or culinary value. Salvia officinalis was described by Carl Linnaeus in 1753. It has been grown for centuries in the Old World for its food and healing properties, and was often described in old herbals for the many miraculous properties attributed to it. The specific epithet, officinalis, refers to the plant’s medicinal use—the officina was the traditional storeroom of a monastery where herbs and medicines were stored. S. officinalis has been classified under many other scientific names over the years, including six different names since 1940 alone. It is the type species for the genus Salvia. Salvia officinalis has been used since ancient times for warding off evil, snakebites, increasing women’s fertility, and more. Theophrastus wrote about two different sages, a wild undershrub he called sphakos, and a similar cultivated plant he called elelisphakos. Pliny the Elder said the latter plant was called salvia by the Romans, and used as a diuretic, a local anesthetic for the skin, a styptic, and for other uses. Charlemagne recommended the plant for cultivation in the early Middle Ages, and during the Carolingian Empire, it was cultivated in monastery gardens. Walafrid Strabo described it in his poem Hortulus as having a sweet scent and being useful for many human ailments—he went back to the Greek root for the name and called it lelifagus. The plant had a high reputation throughout the Middle Ages, with many sayings referring to its healing properties and value. 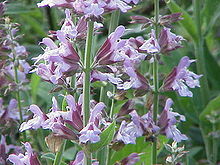 It was sometimes called S. salvatrix (sage the savior). Dioscorides, Pliny, and Galen all recommended sage as a diuretic, hemostatic, emmenagogue, and tonic. Le Menagier de Paris, in addition to recommending cold sage soup and sage sauce for poultry, recommends infusion of sage for washing hands at table. 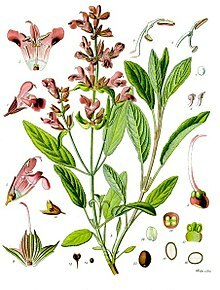 John Gerard‘s Herball (1597) states that sage “is singularly good for the head and brain, it quickeneth the senses and memory, strengtheneth the sinews, restoreth health to those that have the palsy, and taketh away shakey trembling of the members.” Gervase Markham‘s The English Huswife (1615) gives a recipe for a tooth-powder of sage and salt. It appears in recipes for Four Thieves Vinegar, a blend of herbs which was supposed to ward off the plague. In past centuries, it was also used for hair care, insect bites and wasp stings, nervous conditions, mental conditions, oral preparations for inflammation of the mouth, tongue and throat, and also to reduce fevers. In Britain, sage has for generations been listed as one of the essential herbs[by whom? ], along with parsley, rosemary, and thyme (as in the folk song “Scarborough Fair“). It has a savory, slightly peppery flavor. 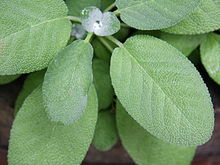 Sage appears in the 14th and 15th centuries in a “Cold Sage Sauce”, known in French, English and Lombard cookery, probably traceable to its appearance in Le Viandier de Taillevent. It appears in many European cuisines, notably Italian, Balkan and Middle Eastern cookery. In Italian cuisine, it is an essential condiment for saltimbocca and other dishes, favored with fish. In British and American cooking, it is traditionally served as sage and onion stuffing, an accompaniment to roast turkey or chicken at Christmas or Thanksgiving Day. Other dishes include pork casserole, Sage Derby cheese and Lincolnshire sausages. Despite the common use of traditional and available herbs in French cuisine, sage never found favor there. In the Levant and Egypt it is commonly used as a flavor for hot black tea, or boiled and served as an herbal drink in its own right. Some research has suggested certain extracts of salvia officinalis may have positive effects on human brain function, but due to significant methodological problems, no firm conclusions can be drawn. The thujone present in Salvia extracts may be neurotoxic. ‘Icterina’ and ‘Purpurascens’ have gained the Royal Horticultural Society‘s Award of Garden Merit. ^ a b Harrison, Lorraine (2012). RHS Latin for gardeners. United Kingdom: Mitchell Beazley. p. 224. ISBN 9781845337315. ^ a b Clebsch, Betsy; Carol D. Barner (2003). The New Book of Salvias. Timber Press. p. 216. ISBN 978-0-88192-560-9. ^ Stearn, William T. (2004). Botanical Latin. Timber Press (OR). p. 456. ISBN 978-0-88192-627-9. ^ Sutton, John (2004). The Gardener’s Guide to Growing Salvias. Workman Publishing Company. p. 17. ISBN 978-0-88192-671-2. ^ Olsen, RW (25 April 2000). “Absinthe and gamma-aminobutyric acid receptors”. Proceedings of the National Academy of Sciences of the United States of America. 97 (9): 4417–8. doi:10.1073/pnas.97.9.4417. PMC 34311. PMID 10781032. ^ Watters, L. L. (1901). 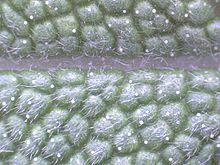 An Analytical Investigation of Garden Sage (Salvia officinalis, Linne). New York: Columbia University. ^ a b c Kintzios, Spiridon E. (2000). Sage: The Genus Salvia. CRC Press. pp. 10–11. ISBN 978-90-5823-005-8. ^ “Le Menagier de Paris”. Hinson, Janet, translator. 1393. ^ Markham, Gervase (1615). The English House-wife. ^ Le Viandier de Taillevent: 14th Century Cookery, Based on the Vatican Library Manuscript. Translated by Prescott, James. Eugene, Oregon: Alfarhaugr Publishing Society. 1989. p. 27. ISBN 978-0-9623719-0-5. ^ “Sage”. OBeWise Nutriceutica. Applied Health. Archived from the original on November 26, 2007. Retrieved 2008-02-04. ^ Miroddi M, Navarra M, Quattropani MC, Calapai F, Gangemi S, Calapai G (2014). “Systematic review of clinical trials assessing pharmacological properties of Salvia species on memory, cognitive impairment and Alzheimer’s disease”. CNS Neurosci Ther. 20 (6): 485–95. doi:10.1111/cns.12270. PMID 24836739. ^ a b Lopresti AL (2017). “Salvia (Sage): A Review of its Potential Cognitive-Enhancing and Protective Effects”. Drugs in R&D. 17 (1): 53–64. doi:10.1007/s40268-016-0157-5. PMC 5318325. PMID 27888449. ^ “RHS Plant Selector – Salvia officinalis ‘Icterina‘“. Retrieved 26 July 2013. ^ “RHS Plant Selector – Salvia officinalis ‘Purpurascens‘“. Retrieved 2 June 2013. ^ “AGM Plants – Ornamental” (PDF). Royal Horticultural Society. July 2017. p. 94. Retrieved 12 October 2018.